I've had a few requests for pictures of my chicken coop and pen. It's a post I've been meaning to get around to writing for some time now. 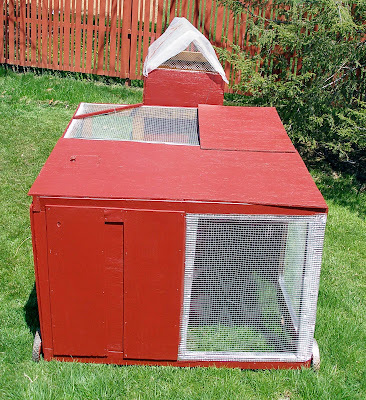 While I don't want to intimidate any would-be backyard poultry keepers, the physical system of my mobile coop and pen are somewhat complex, so this will be a lengthy post with lots of pictures. Don't let that put you off. There's no orthodoxy to chicken housing. Before we get to the pictures and explanation, I should say that the inspiration for keeping my laying hens in a rotational grazing system comes ultimately from Joel Salatin and his wonderful system of rotating cattle, poultry and pigs around his grass-based farm in Virginia. Zoning in my area doesn't allow for free ranging poultry, and I didn't want to destroy any part of my lawn through nitrogen toxicity (chicken manure is loaded with nitrogen) from a fixed chicken run, so rotational grazing it was. It was hearing Harvey Ussery speak at the 2008 PASA conference that really lit a fire under me to make backyard poultry happen. Ussery's presentation was incredibly motivating, and the resources on his homesteading website gave me plenty of ideas for how to design a coop for my needs. I was most taken by the "Cody" design that appears at the bottom of this page on Ussery's site. That coop formed the basis of my own design. You'll see pictures of my flock set up during renovation, priming, and painting, both before and after the hens returned from winter camp. I hope this doesn't confuse any of you as to what you're seeing. So, without further ado - pictures and the discussion of the features. 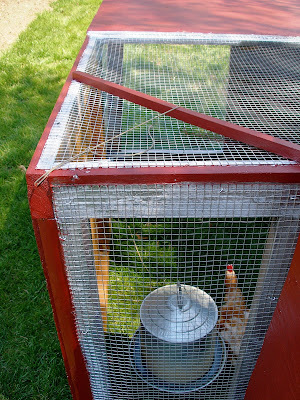 Here's the coop and the pen, "docked" together. The coop is on the left and the pen on the right. When the chickens go into the coop on their own each night, I can close them up inside it to protect them from predators. Then in the morning I can separate the coop and pen with the girls still locked up inside the coop, retrieve the feeder and waterer from the pen to be refilled, move the pen to a new location, replace the feeder and waterer in the pen, snug the coop up to the pen in its new spot, and let the girls out of the coop to enjoy their breakfast. I designed the pen carefully so that the girls would always have access to sunlight, breezes, and shelter from rain or wind when appropriate. 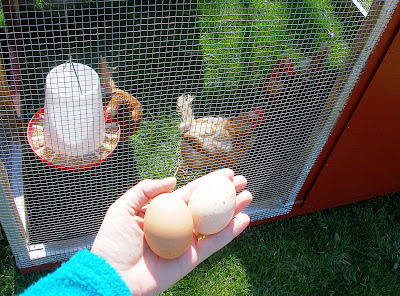 To move the coop, I stand between the lifting bars, and lift them to shoulder height. I can walk forward or backward, and turn as necessary. The wheels at the far end of the coop allow for good maneuverability. Here's a picture of the coop and pen from slightly above. You can see the extra piece of wood lying on the top right section of the pen. This is actually a door that I can use to close the girls in the pen when I need to pull the coop away from the pen for cleaning. When I'm not using it as a hanging door, I place it on top of the pen for extra shade on hot days. Chickens don't like overly warm weather. 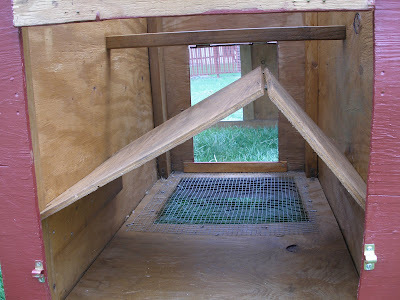 This picture shows the pen interior with the door to the coop closed. The door has a long eye hook with an attached cord that I can use to raise and lower the door. There's also a latch for nighttime security from predators. The hanging door mentioned above would hang just outside of that framed opening. Here's the pen interior with the chicken door held open by tension on the cord (about which, more below). 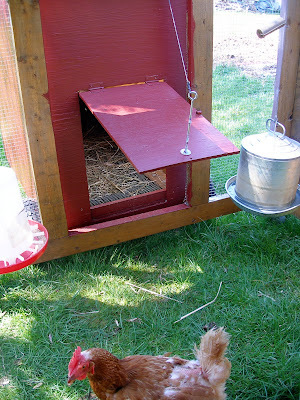 The waterer and feeder hang to either side of the chicken door. Notice, if you can, the round wooden grip hanging from the waterer cord. That's attached there to make hauling the water easier on my hands. I built the roof of the coop with a few issues in mind. Firstly it needed to be predator proof. Secondly it needed to protect the girls from rain. Thirdly it should allow for maximum daylight because exposure to light encourages the hens to lay eggs. They lay much less frequently when the days are short. Fourthly, I wanted to prevent the coop from getting too warm as the girls would be roosting in the roof space each night. And of course, I didn't want to spend much money. 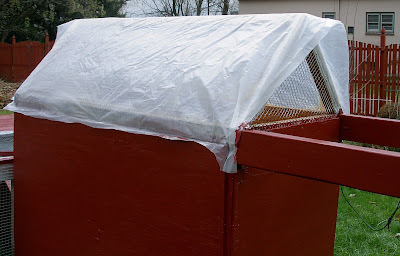 As you can see, a simple stick frame covered by hardware cloth netting and a translucent piece of plastic cut from a used drop cloth will do the trick. I had to replace the plastic sheeting this year, and I imagine this will be a yearly maintenance chore. I left the gable ends of the roof completely open to maximize ventilation, but with a little extra overhang on top to help keep rain out. 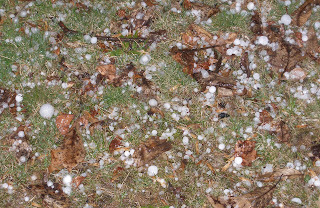 It still lets in a little rain, but the worst of it sheds off. When the overnight temperatures are very low, I cover the entire roof with a sheet to protect the hens from too much wind. 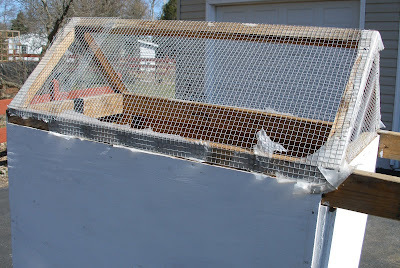 The sheet probably raises the overall temperature of the coop by a few degrees as well. I think the girls enjoy having a view when they're on their roosting bar. This picture of the coop interior was taken during winter renovations. Both doors are off, and the hardware cloth flooring has not been put in yet. Also the roof of the nesting box has been removed. Renovations are mostly done here. 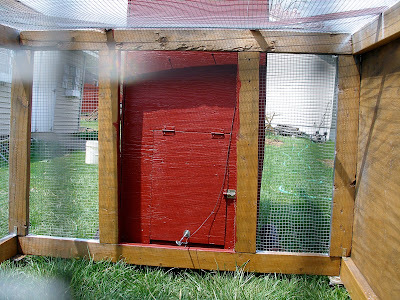 We're looking from the back of the coop, through the open "egg hatch" at the floor of the coop and on into the pen. You can see the hardware cloth flooring to allow manure to pass right through onto the grass. Less manure inside the coop keeps everything cleaner day to day and makes the weekly cleanout easier on me. 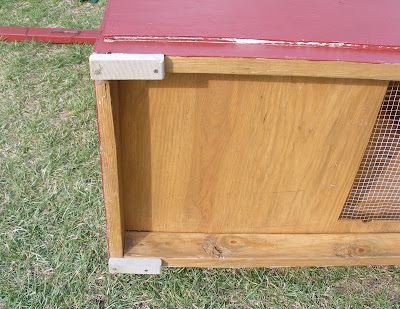 Adjacent to the egg hatch is the removable, hinged roof of the nesting box. The space underneath gets a layer of hay when the hens are in residence. The hens roost above this area every night, but the roof prevents manure from falling into the nest. It also makes the nest area dark when the egg hatch is closed. Hens like to lay in a dark area with a sense of shelter. 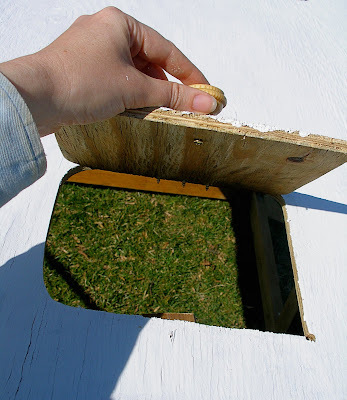 The nesting box roof is hinged to allow easy removal when cleaning. It rests on struts attached at either side to the walls. So I just lift it up, fold it flat, and pull it through the egg hatch. The two sides of my nesting box roof happen to be of unequal lengths because I used what plywood we had found in dumpsters. So long as the roof is about the right height and can be easily removed for cleaning, you could build it anyway that seems best given your materials. Here's a food hatch that I added to the pen this year. This was something I wished all of last year that we'd put in before the hens arrived. Being able to toss food scraps, greenery, and various treats into the pen easily is well worth a little extra effort. It also gives me better visual access to covered end of the pen whenever I want it. Here's the cord that lets me raise and lower the chicken door. 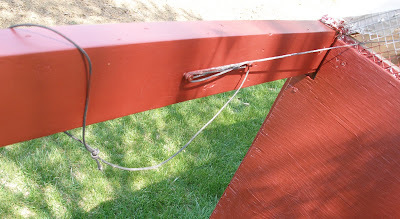 Two screws attach to one lifting bar of the coop so that I can wind the cord around them and keep the door in a raised position. This is the bottom of the coop. On the right you can see the hardware cloth floor, which lets much of the manure pass right through and onto the grass. On the left are small "skids." These are just scrap pieces of plastic lumber that serve to keep the wood off a wet lawn. Otherwise the wood would soon rot. We also put deck sealer all over the bottom of the coop to preserve it. 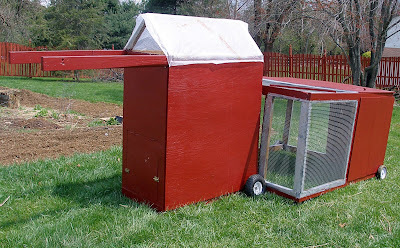 The other end of the coop doesn't need skids because it has wheels. We started out with wheels that were far too wimpy for the weight of the coop. If you pursue a design anything like mine, I recommend you start out with serious wheels with a metal hub. They're not that expensive, maybe $15 for a pair. 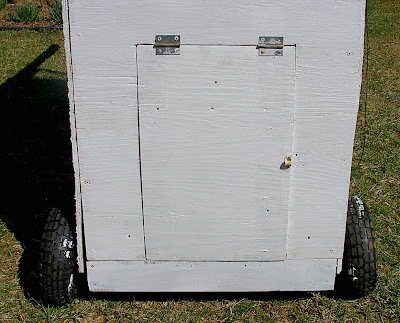 Cheap wheels will cause a lot of frustration and additional repairs with a mobile coop. We put in these support bars on two corners of the pen to bear some of the weight of the waterer and feeder. The nail on the outside corner of the pen takes the rest. We probably only needed extra support for the waterer, but it helps not to have anything resting directly on the hardware cloth roof, which would otherwise eventually cave in. Not counting the wheels, the coop is 4' (1.2 m) high from floor to the base of the roof. The roof is 12" (30 cm) from base to apex. The floor footprint is 4' x 2' (1.2 m x .6 m). There is one roosting bar running lengthwise and one smaller bar running side to side, mostly to keep the walls from bowing outwards. The peak of the nesting box is about 16" (41 cm) off the floor of the coop, though it doesn't need to be quite that high. 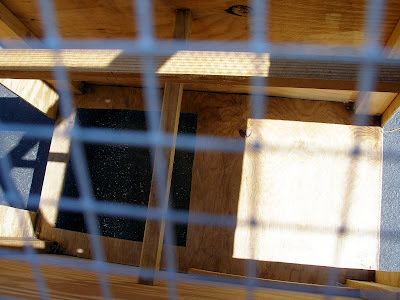 The nesting box occupies slightly less than half the floor space of the coop, about 20" x 24" (51 cm x 60 cm). Most of the rest of the floor of the coop is taken up by hardware cloth mesh. The pen is 6' (1.8 m) wide by 5' (1.5 m) long, and 3.5' (1.1 m) high, giving a total area of 30 square feet (2.8 square meters) and volume of 105 cubic feet (3 cubic meters). This may not seem generous for three or four chickens, but since they are on fresh grass every day, it is quite adequate. For what it's worth, the average laying hen in a US industrial battery facility gets 59 to 67 square inches of space for her personal use, depending on which report you believe. That's about half the area of letter-sized piece of paper. In that space the hen cannot stand erect, preen herself, turn around, or open her wings. Needless to say, the battery hen has no access to sunlight, fresh air, greenery, nor the ability to express her natural range of behaviors. My hens currently have 10 square feet of grassy space each, not counting the coop. Last year, with four hens, they each had 7.5 square feet. If I had to build both the coop and the pen all over again from scratch, I would build with 2x2's instead of 2x4's. The coop and pen are both heavier than they need to be. We could have built it plenty strong with smaller dimension lumber, and that would make it significantly easier to move. (Then again, we more commonly find 2x4's in dumpsters than we do 2x2's. Using free materials was a priority when we built this, and likely would be again.) I would also make both coop and pen shorter. Not knowing how high either pen or coop needed to be, I erred on the generous side. I think the coop could easily lose 8 inches or even more, and the pen could be shorter by that much as well. Less height would again make the morning moving routine easier. 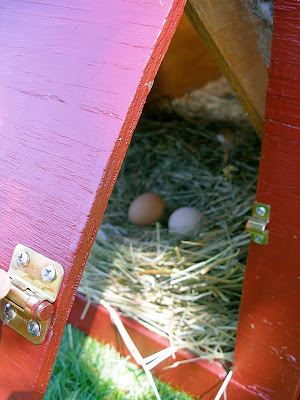 The first year we built both the chicken door and the egg hatch with the hinges on the bottoms. This was a mistake, because a lot of hay and debris fell into the jambs and made it very difficult to close the doors. This year I switched them around so the hinges are on top. Best of all would probably be doors that simply raise and lower like a guillotine, but are easy to secure in place for predator deterrence. I might design for that if I had to do it over. Okay, then. I think that about covers my chook equipment. Questions about anything I did or didn't cover? Ask away in the comments. 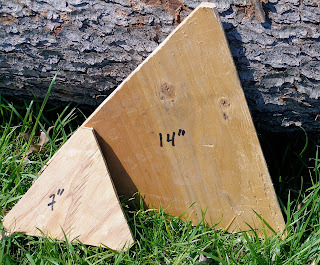 I've got a post up today on a simple planting tool over at the Simple, Green, Frugal Co-op. Check it out over there. And yes, I do plan to talk soon on my mobile chicken coop and pen! Thanks for asking and thanks for your patience. Expect a detailed post on Cluckingham Palace this week. The girls are back! 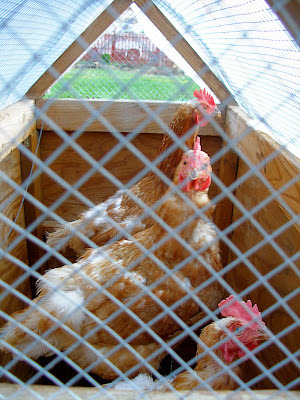 This morning I retrieved my three surviving hens from their winter camp. They look pathetic and very bedraggled. I know they were well cared for by my farming friend, but they were also housed with a rooster, so they've taken quite a bit of abuse from him. Their feathers are so beaten up they look like they've got mange. By way of explanation my friend informed me that all the hens get worked over by the rooster, but the older the hen, the more brittle her feathers. So my girls' feathers broke off more easily. She added that she's sure my girls will be happy to return to their "cloistered existence" on the mini-homestead. I got them home and squared away by 9 am. Then I came inside, had the cup of tea I'd had to forego when I dashed off early to get the girls, did some housework, and by 10:30, what do you think? These three-year-old hens are laying champs! 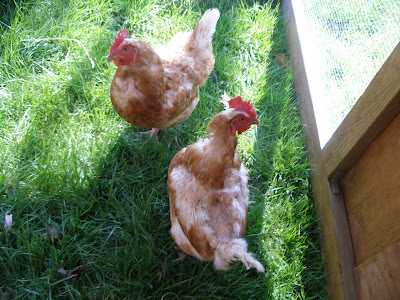 We are delighted to have the girls back, and to once again have good reason to save little tiny bits of food for them. I've really missed being able to do more with stray grains of cooked oatmeal and rice than just chuck them in the compost. The home economy is once again back on track now that the girls are home. Here's hoping their feathers grow in quickly. I also wanted to let the curious among you know that we enjoyed some of those mystery turnip/mustard/nabiça greens with dinner last night. They were just slightly bitter, but went very well with nice fatty servings of salmon. So satisfying to have something fresh and green from the garden this time of year. They cooked down quite a bit, so in future I'll gather much more of them for dinner. Though it usually bothers me not to know things with certainty, I'm quite content to keep growing this plant without knowing for sure exactly what it is. 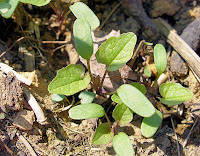 Any plant that does so well in my area with so little help from me, and that comes up very early in the spring to provide fresh greens, AND which I can feed to the chickens is more than welcome and worth keeping around. This to me seems the essence of sustainable living. We've got summertime weather forecast for the next few days. Sunny and hot, with temps reaching up into the 80s F! (That's the high 20s C, for you civilized folk.) So we're going to try to get as many of the remaining spring chores done as we can while the sun shines. We're still two weeks ahead of our average last frost date. 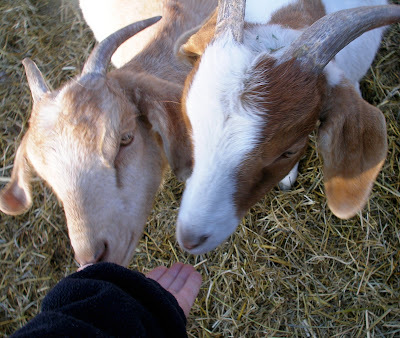 I leave you with some completely gratuitous shots of my friend's adorable farm animals. I got to hold some of these darling lambs this morning. My cat sniffed my coat for quite a while when I got home. Have a great weekend everyone! I meet the goat "kids." When I first saw them the one on the left was nursing from its mother. The kid was about 85% of the size of mom. Friend said these were the runts of the litter last year and were too small for butchering at that time. 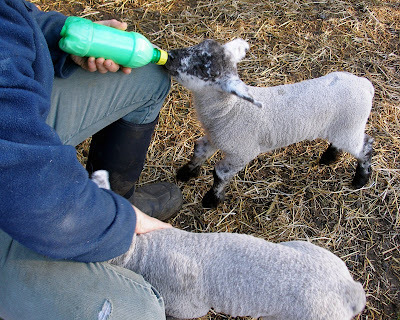 Two of the triplets born to one sheep get some supplemental goat's milk. It was out of the goat for about 3 minutes before the lambs got to enjoy it. 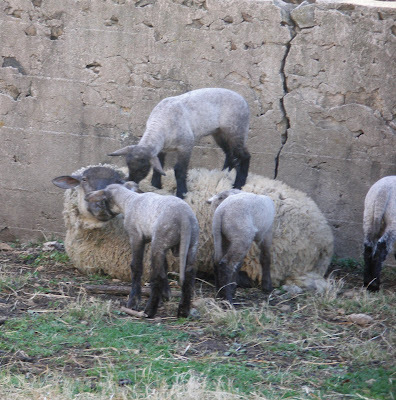 Sheep moms get wearied out by shenanigans too. They make pretty good furniture though. Okay, gardening folk, got a question for you all. What the heck is this vegetable? These things came from a trade arranged via GardenWeb. Someone asked for some of my seeds and offered parsnip seeds. I'd never grown parsnips before, so I had no idea what the seeds were supposed to look like. I didn't bat an eye when they looked like little mustard seeds. (For the record, I now know what real parsnip seeds look like: nothing like mustard seeds.) I duly planted them in good loose soil and watched them grow. After a few frosts I harvested some roots. They tapered very smoothly and were bone white, not quite like the yellow-white, irregular parsnips I was familiar with. But I peeled them and tried adding them to a stew. Big shock when I tasted them. They weren't at all sweet, and the overpowering, mustardy taste alarmed my mouth. I fished every piece of this faux parsnip out of the stew and added them to the compost bucket. I'm as close to 100% certain that this plant is in the brassica family as I can be. 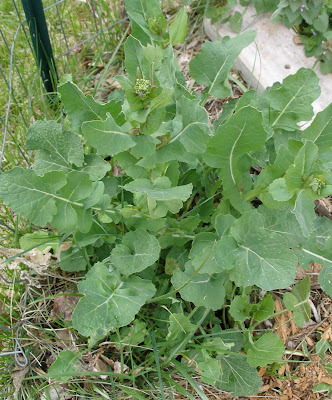 The leaves look brassicky, and when they set seed last spring, they did so in typically prolific brassica style, with little yellow flowers followed by small pods. Our laying hens positively went bonkers over any of the leaves I was willing to cut for them last spring. These chance seedlings popped up last year and are growing quickly already this spring. They have much lumpier roots. They're not in well worked ground, so the roots are encountering much more resistance. I think you can see why the person who sent the seeds to me might have believed that these were parsnips. I'm assuming good faith here. After the inescapable conclusion that these were not parsnips, I suspected that they might be the European root crop, the rampion. But since the rampion is not a brassica, I now have my doubts. 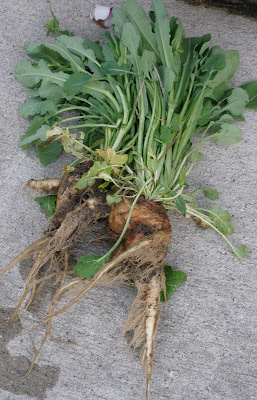 Besides, rampions are said to have sweet roots with a nutty flavor. So I'm stumped. I'm willing to let these mystery plants hang around and grow where they may, since my hens seem to love the leaves so very, very much. But if there's some part of it that we could be eating, I'd sure like to know. This spring we're turning our attention more and more to edible landscaping. Most of the obvious spots around our 2/3 acre property have been spoken for. We now have one fully mature and very large apple tree, one old and marginally productive plum tree, two newly planted cherry trees and two newly planted pear trees. We also started asparagus, blueberries, elderberries and raspberries this year, all of which will take years to reach their full bearing stages. The areas left to us to consider are all marginal in some way. There are patches of ground in full or partial shade. There are places that are in full sun now, but will be fully or partially shaded when those fruit trees and berries get larger. Much of the perimeter of our property is made up of poor soils where junk was dumped over the years; trash piles, essentially. The ideas of edible forest gardening and permaculture are helping me see these spaces in new ways. Certainly it is challenging to envision what could be done with them. Even if I can't create a true forest garden in such small spaces, the concepts of forest gardening provide me with several tools to work with. One basic idea of forest gardening is to layer plants in any given space. For instance, you can have a bush surrounded by a ground cover that doesn't need full sun, and the bush itself may be shaded part of the day by the canopy of a full sized tree. 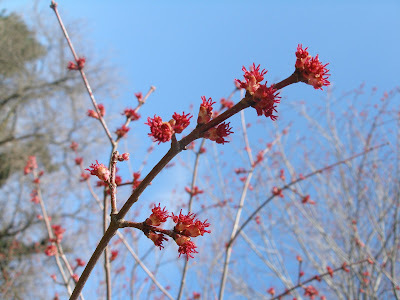 Forest gardening challenges the gardener to know plants and their requirements a little more deeply than conventional farming, which generally relies on giving annual plants full sun as often as can be managed. One key in forest gardening is to find plants that can live cheek by jowl without competing with each other. In other words, the plants need to exploit different niches in a given ecosystem. While they will need to grow under identical conditions of climate, soil type, and rainfall, they need to have different nutritional requirements. Different heights and root structures would be nice too. Instead of mulching all around my blueberry bushes, so that they exist in isolation, I am looking for a ground cover that can grow in highly acidic soil (which the blueberries require), will tolerate being stepped on occasionally (I will need to harvest at some point in the future), and doesn't need full sun to grow. Oh yes, and I'd like it to be either edible, or have some medicinal virtues, or feed my laying hens. Those are my must-have properties for this plant. If it can fix nitrogen in the soil, outcompete other low-growing plants, and/or provide nectar for bees, so much the better. Sounds like a tall order, doesn't it? It is. But at least by having identified the characteristics of the plant I'm looking for, I now have a chance of finding it. Any ideas from you out there? Fortunately, I have found at least one online resource that can help me search by some of these parameters. It's the Plants for a Future database, and it contains fairly detailed information on useful plants that will grow in a very wide range of climate zones. There are several ways of searching for plants in this database, and the website also has lists of the most highly recommended plants for permaculture. Of course, I don't get everything I could wish for in this database. I can't search specifically for plants that can be used as animal fodder. The listings for many plants will specify if they are nitrogen fixing, but it's not a search parameter that I can select in a highly detailed search. There is a fair chance that many of the plants identified as edible for humans are also good to feed animals, but I've never seen this information offered in the listings. So far the best looking candidate plant for my blueberry area is Corsican mint. Check out the listing in the database - the amount of detail is impressive. I find that I'm turning to this database fairly often as I explore and carefully consider the marges of our property. Turns out that fenugreek and salad burnet, both of which produce edible greens, are great candidates for the junky area where we ripped out the forsythia. They both tolerate poor soils. The fenugreek will fix nitrogen in the soil while giving us both greens and seeds to grind for spice. Fenugreek is widely used in Iranian and Indian cuisines, both of which we enjoy. Salad burnet is tough enough to reclaim and heal badly damaged ecosystems in mined areas. It also provides nectar for bees for most of the growing season. Both of these plants will eventually be shaded out by the young elderberry plants we put in, which may reach 18 feet (6 m) tall. But in the meantime, they'll keep less useful plants at bay while providing us with a little food. Expanding the list of foods we eat is part and parcel with edible landscaping. The more we insist on growing our own food, the more we are driven to eat what will grow in different areas of our property. Sometimes that means getting to know an unfamiliar food. The mainstream diet makes use of a fairly narrow range of all possible edible and nutritious plants. So, in trying to supply our food from a small piece of land, we are forced to stretch our tastebuds and our comfort zone. I can't help but suspect that this is probably a good direction for our own health. A diverse range of plants in the diet, each one eaten in turn at the peak of ripeness - what could be better than that? In his book, In Defense of Food , Michael Pollan recommends that we not buy or consume anything our great-grandmother wouldn't have recognized as food. It's a pretty good rule of thumb. Yet I doubt that any of my great-grandmothers would have recognized fenugreek as food. But someone's great-grandmother would have. If that's bending the rules, then so be it. What are you growing this year that's new to you? It is so obviously springtime here. Even though I've been fairly busy outside, I feel like I have nothing to report. Evidently I'm not alone. 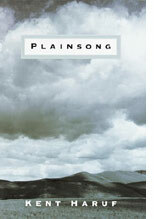 Half my blog reading list has gone stealth in the last couple of weeks. We're still working on hauling away the debris from cutting down three evergreen trees a few weeks ago. Surprising how fast the bed of the beater pickup truck gets full. Plus my husband ripped out a fair sized stand of forsythia to make more room for things that will feed us. All that had to be hauled away as well. Now we're sort of debating which berry to put in that spot. The soil looks none too great. The comfrey is up and starting to grow rather quickly, and the one I moved under the apple tree last fall seems just fine. The oregano and thyme evidently made it through the winter, because they are putting out tentative green leaves. What's more surprising, and therefore more exciting, is that the ramps we transplanted last year are coming up. We were sure they hadn't made it. The leaves keeled over and apparently died shortly after transplant. Even the even spacing and location of the leaves didn't convince me. I had to break one off and sniff it. 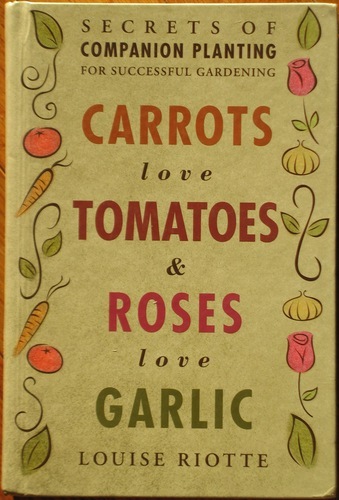 No question that stuff is in the garlic-onion family! So now we have a few ramps poking up. I've never eaten them before, and there are only 8 or 9 of them out there. So fill me in, please. Should I let them just do their thing this year so that there will be more to harvest next year? Our seed potatoes arrived, and I've started them chitting (pre-sprouting) in a dark, moderately warm spot inside. Also our two cherry and two pear trees, along with our asparagus roots. We don't have the raised beds built yet, don't even have the materials for the beds. So typical of us. This was something I had hoped to get to before the plants showed up. The weekend after this one I have to go pick up my four blueberry bushes from the Extension Office sale. On top of everything else, the weather has been crazy. It snowed on Wednesday this week when it was 42 F outside. I know; I didn't think that was possible either. But it is. I had to look it up, but it can happen, and it did. 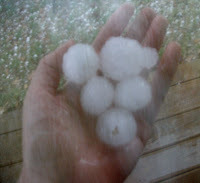 About 10 days ago we had hail large enough to destroy the glass on my coldframe. The plan was to do some chipping last Saturday, but it was so windy that the chips simply blew away when they came out of the chipper. And then there's been the odd 63 F day sprinkled in there among all the cold and gray ones. The temperature has fallen below freezing overnight a few times, but never on the nights that it was predicted to. I like spring, but the mercurial weather (no pun intended), I could do without. Since we have clay soil, all the rain we've had is making it very difficult to get an opening to plant. Planting trees (or anything really) in clay soil that's wet is a Bad Idea. 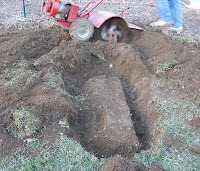 The soil gets all compacted and loses what little microbial life was in there. We've been modifying the design of our chicken coop, a project that has been moving at an agonizingly slow pace. Part of this - but only part of this - delay can be chalked up to the weather again. It was either too cold or too rainy for quite a stretch of time to do any priming or painting. The painting is nearly done now, but we have a much more serious design issue to overcome. I plan to blather on about my mobile coop and pen in a lengthy post, TK. In related but sad news, we heard one of our hens died while at winter camp. I was sort of prepared for this, so I'm not too upset. At least we didn't have to kill her, and she wasn't killed by a predator. Just dead one morning. We'll see how the others are doing just as soon as we get our act together with the chicken digs. We discovered a huge cement slab in the process of extending our garden. What fun! Too big to move, and right where the potatoes were supposed to occupy long, uncrowded rows so different from last year. Nothing to do about it, couldn't find the bottom of the slab even two feet down. It was going nowhere. I attempted to do a little biochar trial by filling the space all around it with twigs and stuff. You know, for carbon sequestration and soil improvement. Bloody weather once again - the wood was all pretty damp. I'm going to file that one under "nice idea if you happen to have a lot of seasoned twigs lying around." What else? Oh, yes. I bought some durable row cover and have set out some lettuces. As soon as the cover went up about a thousand volunteer seedlings popped up. I would have ripped them out, or some of them anyway, but they were more or less in areas where the ground cherry volunteered last year. In case you're curious, I'm pretty sure we had "clammy" ground cherries, Physalis heterophylla, and no, that doesn't refer to the texture of the fruit. It refers to the slightly sticky stems. I'm about 80% convinced that that's what these are, so I'm leaving them for now. I have a spot in mind for them where they'll be able to grow year after year, under our new fruit trees. Turns out, the plant will form a rhizome and regrow from that. So, a little more time and we'll know for sure whether that's what we've got. My garden is probably at its ugliest in early spring. I pushed my luck again today and planted out a few leeks and shallots. I will probably need to cover them. I just couldn't stand looking at a mostly empty garden anymore, plus I'm running out of room inside for seedlings. By this time last year, I had harvested a small pile of baby Tuscan kale leaves. This year, with a cooler spring, the surviving kale plants are just barely starting to green up. Other than yardwork, I've been spending my time madly researching forest gardening after watching this amazing video. I don't know why permaculture or forest gardening didn't interest me when I first heard about it. But it's got my full attention now. Which means tons of reading and pondering, and inter-library loan requests of course. I keep hoping that one of these years we're going to have a spring that isn't insanely busy, one where I don't feel like I'm behind schedule all the time. Just once, I'd like that. Next year, if my husband still has a job, I'm going to lobby for two weeks' vacation in April. I rarely cheerlead for products or services, and I don't think I've ever promoted a particular plant before. But today I'm going to discuss the many merits of comfrey, because it's both extremely valuable in the home garden and also little known. Comfrey is an herb native to wide swaths of Europe, long known for its soothing medicinal properties. Many over-the-counter skin ointments and homeopathic products include this herb for its healing qualities. One of the effects of comfrey when applied topically is to increase the rate of cell division, so that wounds and burns heal more quickly. A woman in my area posted an advertisement last year looking for fresh comfrey. She had a skin condition that hadn't responded to any treatment she had tried. She used some of my Bocking 14 comfrey to make a tea that she soaked her arms in and later told me that the comfrey helped more than anything else had. She just sent me an email asking if my comfrey had any leaves up yet this year. Comfrey also reduces inflammation, swelling, and irritation. If you enjoy home remedies or making herbal salves, comfrey would be an excellent addition to your garden. There's an ongoing debate as to whether or not comfrey can be safely consumed, even by animals. There is apparently some level of toxicity for the liver, both in humans and in animals. I am definitely not recommending that anyone consume any part of the comfrey plant. However, some studies suggest that a toxic dosage would only be reached after consuming huge quantities of the leaf or root. Comfrey is very widely used in Japan as an animal fodder, without any ill effects, evidently. And I have spoken to several homesteaders who regularly give small quantities of comfrey leaf to their chicken or duck flocks and even to pigs. I myself have fed my laying hens comfrey leaf about once a month in modest quantities. The chickens absolutely relished the stuff. Since comfrey leaves are very high in protein, this isn't surprising. I never observed any detrimental effect on the hens after feeding them comfrey leaves. But comfrey has yet other virtues beyond healing and animal fodder. Comfrey is a bioaccumulator plant whose long roots mine minerals and nutrients from very deep in the soil. 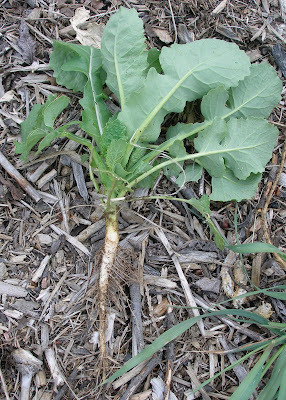 (There are reports of comfrey roots reaching as much as ten feet deep into the ground!) Other culinary and medicinal herbs grown adjacent to comfrey have been observed to contain higher levels of essential oils and flavor than herbs of the same type not grown next to comfrey. Comfrey leaves can be cut and used as excellent green manures for other garden vegetables. The first leaves put out by comfrey plants each spring were traditionally used specifically with the planting of potatoes, to give the potato plants an early boost of nutrition and growth. Comfrey is particularly known as an excellent companion plant in fruit orchards, especially apple orchards. With its tall and densely growing leaves, it will easily outcompete other nearby plants, reducing the need for weeding. Though it likes full sun, it can also tolerate the shade under fully grown trees. This contributes to its utility in orchards. Although comfrey will not spread aggressively if left undisturbed, it is quite tenacious once it is established. And if the earth around it is tilled, new plants will grow from broken off fragments of root. If you want to eradicate comfrey from a particular spot, it will likely take some doing. So choose a spot to plant it with care. I have heard tales of gardeners cutting comfrey to use as green manure when planting other crops, only to find that the cut leaf took root and established itself in the new location. I haven't seen this happen [Update: I have seen this happen. ], but then I take the precaution of letting all comfrey cuttings intended for green manure wilt in the sun for a few hours after cutting. Along with its utility as a green manure, comfrey is equally valuable as a foliar feed ingredient. Foliar feeding is a natural form of fertilizing that uses weeds or other plants in a fermented liquid state. Like all anaerobic fermentation, a foliar feed made from comfrey leaves will smell atrocious. But it produces a natural, concentrated liquid fertilizer that can be diluted and applied to the leaves of many vegetable and flowers. The comfrey varieties I have planted have large, somewhat oval, slightly hairy leaves that grow up to about 30" tall. Near the base of the leaf stalk the hairs sometimes develop enough heft that they become small prickles, much like a summer squash vine will produce. But they are not particularly bothersome. In their second year comfrey plants put out borage-like flowers for a long time from late spring to to late summer. They vary in color apparently, but my plants' flowers are purple. Most varieties of comfrey do not reproduce themselves well from seed, but will readily grow from root divisions. There are several varieties of comfrey, all of them fairly hardy perennials. Some varieties are hardy up to zone 3, but most are hardy to zone 4 or 5. The Bocking 4 variety was specifically developed as a green manure, while the Bocking 14 was developed as animal fodder. This is such a useful plant that I recently ordered a third variety, common comfrey, and plan to divide the roots of each type of comfrey I grew last year. 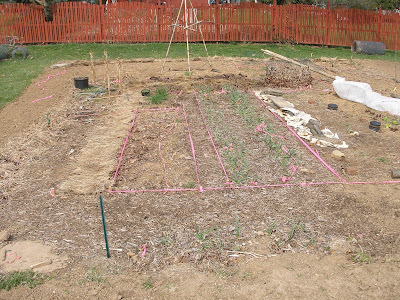 It will allow me to make good use of the shaded areas of my property where very few edible things will grow. Instead, I'll harvest the fertility of those spots and transport it to my garden beds in the form of comfrey leaves. I can scarcely credit so many wonderful qualities packed into this one plant. Comfrey has medicinal uses, can feed livestock, and greatly enhances the fertility of my garden soil. On top of that, it's an attractive plant that has few pests and provides a bit of food for bumble bees. I can hardly think of a non-edible plant that I would consider so essential for a sustainable garden as comfrey. If the long term fertility and health of your garden soils are of concern to you, look into comfrey! I got my comfrey plants last year from Richters. They have an amazing selection of herb seedlings, and the prices aren't too bad. I only wish I'd ordered some of the intriguing Piss-Off plant! Update: check out what I learned at the 2010 PASA conference for yet another awesome attribute of comfrey. Just when I thought this plant couldn't be any more impressive, I found out I was wrong. This month's Action Item is all about paper. Disposable paper items abound in western culture. They are designed for obsolescence. Sometimes their utility life from first use to disposal is mere seconds long. I want to challenge you this month to see paper products, especially those you pay for outright, in a new way. When you go to the supermarket and look at paper towels, toilet paper, paper plates and cups, and even "feminine hygiene products," you are looking at landfill. In other words, you're about to spend your hard earned money on garbage-to-be. Think about it: paper plate lying on the ground in a park - garbage; paper plate stacked up with other paper plates on the grocery store shelf - something you pay good money for. Does that make any sense to you? This is definitely one of those areas where frugality and ecological ethics match up very closely. Sometimes we don't pay for paper explicitly. We get the paper for "free" with our purchase of coffee, fast food, or other convenience items. Needless to say, this is no bargain. Not only is the paper being consumed in a ridiculously frivolous fashion, but along the way you're paying a huge premium for the convenience of having food prepared for you, rather than making it at home. Yet another form of paper consumption that I'm targeting for removal this month is junk mail, catalogs, and newspaper or magazine subscriptions. I've blogged before about all the good reasons for getting off catalog mailing lists. If you're trying to trim the budget (and these days, who isn't? ), you don't need temptation delivered to your door on a daily basis. So without further ado, here are several ways to cut the paper out of your life and save some money in the process. Newspaper - you're reading this online. Get your news online too or off the radio. Cancel your subscription and ask for a refund of the balance. If you use the coupons that come with the Sunday paper, see if a non-frugal friend or family member will save the coupon section for you. If you can't make that happen, at least cut your subscription back to just a Sunday delivery if possible. Magazines - Do you really read the magazines that you subscribe to? If you do, and you learn something from them, great. See if there's anyone in your area who also reads the same magazine who might like to split a subscription. You'll save both money and paper. Even better, cancel the subscription and get the magazine from the library. Unless you're subscribing to a magazine that is so packed with useful information that you're certain to refer to it again and again, it's worth asking yourself if you really need to pay for a personal copy. Napkins - I hereby give you permission to actually buy new cloth napkins if you don't already have some. If you're going to do so, I recommend you steer clear of white or very pale napkins, which will show stains the best. If you have the choice, go for napkins with a small pattern on them; they'll hide stains very well over the years. Choose a sturdy flat woven cotton cloth with good stitching at the seams. I suggest you buy one for every member in the family you have or plan to have, plus at least two more for guests. If you have no cloth napkins, and your birthday is this month, this is the perfect gift to ask for. They'd make nice housewarming gifts too. Paper towels - There aren't too many tasks that really ought to be done with disposable paper. Cleaning up cat puke or other unmentionables may qualify. But those should be rare events. Use cleaning rags to wipe up most spills and to perform most cleaning chores. You can replace paper towels for some uses with pages torn from old phone books. Phone book pages work great for cleaning glass. They'll work for soaking up grease from fried foods too. Junk mail - There's no reason to put up with junk mail. There are plenty of unsubscribe lists you can find online. Fewer catalogs in your mailbox mean less covetousness, fewer temptations to spend, and less clutter in your life. Paper plates - Again, is there really any need? Even if you want to go on a picnic, re-usable plastic plates, or the new re-usable Bambu plates fill in just fine for disposable paper. There are some plastic picnic plates that can even stand up to the dishwasher. If paper plates fill a need in your life, see if the re-usable lightweight plates could step into that role. Paper cups - I can't conceive of any real need for these at home. Again, if you picnic or camp a lot, durable plastic cups will serve. Be disciplined about using your own mug at the office water cooler, or if you're still indulging in cafe drinks. Tampons or Sanitary Napkins - I know not every woman is going to be swayed, but I am totally converted to the use of the diva cup. Over at the Simple, Green, Frugal Co-op where I occasionally post, Eilleen discussed the re-usable cloth menstrual pads she uses, in conjunction with the diva cup. There's no question at all that women pay a lot of money to menstruate in mainstream fashion. When I debated buying a diva cup, a quick calculation told me I'd break even after eight months of using the cup versus tampons. If you're smart enough to switch to a diva cup in your early years, you'll probably save more than $1000 by the time you hit menopause. That's not a trivial amount of money, especially considering that the money is just paying for landfill. If your first reaction is squeamishness, try giving it a second or third thought. Note pads and scratch paper - Okay, even when you've gotten off as many of the junk mailing lists as possible, you'll still get some unwanted mailings and then a few legitimate pieces of mail. Use the envelopes for your grocery lists, notes to family members, etc. This is a much better choice than actually paying for a small note pad. And if you open up that junk mail and find paper that only has printing on one side, you can use the other side for scrap paper too. Obviously, pay attention to what information might be printed on the used side. You might not want to lose a shopping list that has your financial information printed on the back. So just shred that stuff and use the form letters for your to-do lists. If the paper isn't folded or the folds won't be an issue, you can also use blank sides of full-sized paper in your computer printer for drafts or informal use. Paper shopping bags - C'mon. You know the drill here. Instead of facing that familiar ethical dilemma between deforestation (paper bags) or albatross chick and sea turtle mortality (plastic bags), let yourself off the hook already and make a habit of canvas or recycled plastic shopping bags. Keep a few in your trunk, or wherever you'll remember them. It's not that hard. And it's becoming commonplace enough that you won't be mistaken some granola-munching, patchouli-smelling, Birkenstock-wearing hippie these days (if that concerns you). If you're fortunate, the store you shop at is forward-thinking enough to give you a small bag credit for providing your own bag. Advanced Action Item: There's really no alternative item this month. Instead we have a few items that are for frugality/sustainability adepts. If all of the above is old hat for you, then you've probably already considered these options. I freely admit that I'm not yet at the point of committing to cloth toilet wipes. Since I don't have kids, the diaper issue isn't one I have to contend with. (For the record, my own infant years were spent in cloth diapers.) If you are still in the process of having babies, or if kids are in your future, consider the many advantages of cloth diapers, not least of which is the monetary savings. Trent at The Simple Dollar wrote up a cost comparison between cloth and disposable diapers. His conclusion was that he wished he'd put his first child in cloth diapers rather than waiting for the birth of his second child to make the switch. 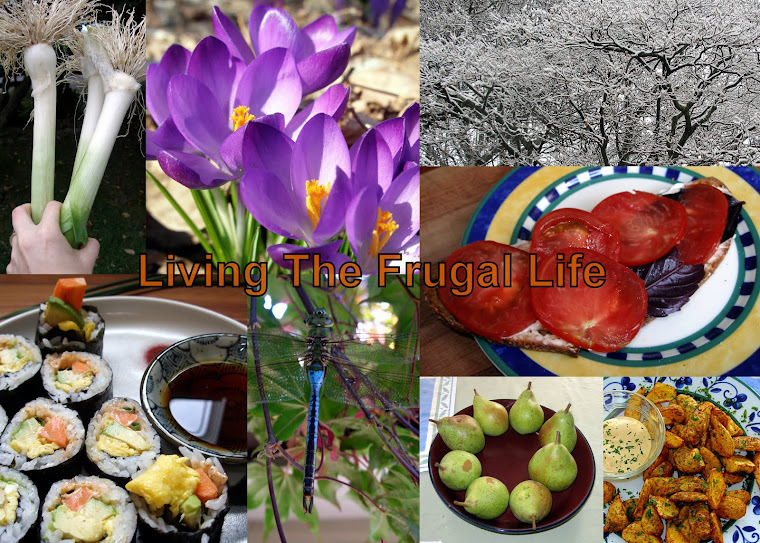 For those of you who have been following along with these Frugal Action Items since the beginning of the year, how's it going? Have you noticed the savings? Have your efforts made a difference in your budgets or savings goals? Please chime in via the comment section.